You may think that hand quilting is a dying art, but nothing could be further from the truth. There are many of us in the quilting world who continue this time-honoured tradition. Of course, we all love and appreciate the intricate detail of machine quilting, and personally, I am always in total awe of the talent and skill that it requires, but my first love will always be to quilt by hand. There are many reasons why I love it and most of them are self indulgent. First, and foremost, I love to sew by hand. It’s that simple. I am never happier than when I have a thimble on my finger and I am stitching. The second pleasure is that sharing time with family and friends is so much easier when I am actually in the same room with them. Don’t get me wrong, I love my machine, but it is a solitary experience. Sitting at a sewing machine is not the place for company . Being able to chat, watch a movie or simply share some quilting time with someone can be a delight. The next pleasure is visual. 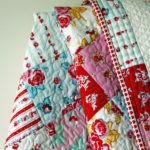 A quilt that has been heavily hand-quilted can have a soft look and can be more textured than a machine-quilted one. To me, a quilt that has been custom machine quilted will be crisp and fresh. Beautiful in it’s own right, but different. Lastly, something I hear all hand quilters say, is how much they love the sound of the ‘pop’ when the quilter’s knot snaps into the quilt. It is such a tiny thing but it’s a pleasure all the same. 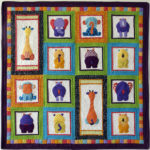 Often the best quilts to show off the quilting are simply pieced. My small quilt Waiting For You has simple shapes and lots of borders. This allowed me to use intricate stencils and detailed cross-hatching. 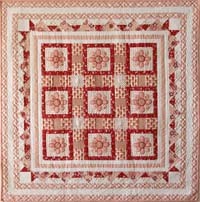 The soft, faded palette and the heavy quilting has given it an old-world look. I made this quilt for my daughter-in-law when she was awaiting the birth of her first child and our first grandchild. Whenever I go to stay with them this quilt is on my bed and it brings back all the feelings of anticipation and the joy of new life. Let’s hear a cheer for us hand quilters. We are keeping alive the traditions of the women who have gone before. Keep those quilter’s knots popping, and happy quilting. The Cherish Quilt Pattern is perfect for a new quilter and is very easy to make. Download it today. This is lovely I’ll download the pattern and hopefully get to make it ione day. It reminds me of the quilts I saw in Wales. Thanks, Judy. I hope you enjoy making it and hand quilting it! Hand quilting is alive and well! That is so good to hear! Together, the traditions live on. People who don’t sew tell me that they wouldn’t have the patience to hand quilt. I tell them that hand quilting GIVES me patience! It always relaxes me. That is so true Kimberly. It is like a meditation!